While the bill does well to raise awareness about such a critical public safety hazard, it doesn’t go nearly far enough. Florida is currently one of only five states without any type of texting while driving restriction. It is far time that Florida enacts a real and meaningful bill that does more than pat our legislators on the back but, rather, actually saves lives. Through its lack of substantive action, the Florida Legislature continues to trivialize a grave and serious issue — flying in the face of overwhelming data and empirical evidence that texting while driving is the leading contributor to one in four motor vehicle collisions. Numerous sources, including the Insurance Information Institute and the National Highway Traffic Safety Administration (NHTSA), report the carnage and loss of life visiting Florida’s roads and which justifies immediate action to bring our state in line with the rest of the nation. On June 7, 2012, the Centers for Disease Control (CDC), released a study indicating that one-third of all high school kids admitted to texting or emailing while driving. One such teenager, Aaron Deveau, 17, faced trial for criminal charges for a head-on collision with a pick-up truck, killing a father of three in Massachusetts. He was charged with driving while using a mobile phone or sending electronic messages in violation of Massachusetts law. If this homicide occurred in Florida, there would be no criminal action or deterrence. The overwhelming body of evidence demanding legislative action is well understood by Florida lawmakers, but politically ignored. 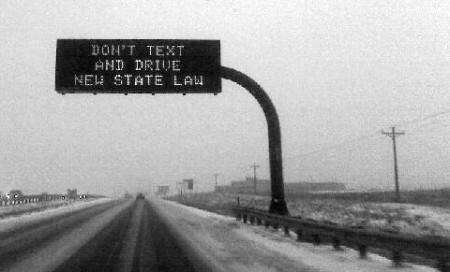 Anecdotally, and by statistical data, government studies and a large body of literature, it is now undisputed that cell phone driving/texting is a dangerous and well-recognized hazard. Every one of us can recall a time where we had to swerve in reaction to an inattentive driver weaving through lanes of traffic as they aimlessly play on their phone. The Florida Legislature’s failure to act is bad for consumers, bad for business, and bad economics. Business owners will continue to be legally held responsible for the negligent cellphone driving behavior of their employees. Verdicts are on the rise, as is expanding liability, against every business owner who encourages or, more importantly, fails to discourage cell phone/texting use. The employee on the phone in his car is now equivalent to an employee in the workplace or office if the conversation is business related. Last year, Americans sent more than 600 billion text messages, 10 times the amount sent three years ago. For the year 2010, an estimated 2,600 deaths and 330,000 injuries resulted from driving while using a cell phone. The numbers are rapidly growing. Inattention blindness resulting from driving while distracted (DWD) is a recognized cognitive impairment by the medical, scientific and human factors community. Studies published in the New England Journal of Medicine and the British Medical Journal confirm that talking on the cell phone while driving increases the risk of having an injury-causing accident fourfold. In a recent civil legal proceeding, a young woman driving and using a cellphone struck and killed a child. The defendant broke down in tears, explaining that her cellphone call was unimportant, social and unnecessary. It was, she said, “the worst call I ever made.” Her cell phone intoxication resulted in a needless loss of life. The very worst call was to the parents of the deceased child. Action by Florida law makers is long overdue. Now is the time for them to make the “right call” — stop wasting taxpayer time by debating useless bills and craft one that will actually make a difference. Ira Leesfield is founding partner of Leesfield Scolaro, personal injury law firm.